This is one of the plants we got last weekend. I know this flowering plant as 'Rosal'. But it's not called the same here. 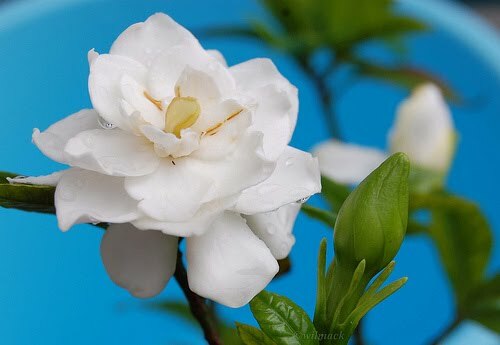 I think it's called 'gardenia'? I have to check the tag again tomorrow but the flower is very much like the rosal that I know of...very fragrant. The guy at Lowe's said that he loves his at home and highly recommended it to us. Hubby and I already had it in our list of what we wanted to get but we weren't sure how good they'd stand with the kind of weather we have here. According to the Lowe's guy, they survive pretty well. We just have to cover them in really cold weather. They won't die but the flowers may not bloom as much and as early.